NORTH BAY, Ont. – Justin Brazeau and Luke Burghardt paced the North Bay Battalion’s offence in 2017-18, ably supported by Matthew Struthers in the second half of the Ontario Hockey League season. Brazeau scored a team-leading 39 goals and added 36 assists for 75 points, while Burghardt had 28 goals and earned a team-high 43 assists for 71 points, both playing the full 68 games, all but a handful on the same line. 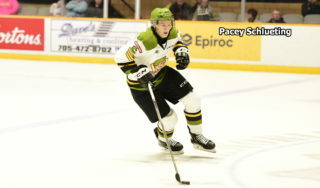 After joining the Battalion in a Jan. 3 trade from the Owen Sound Attack for Brett McKenzie, the Troops’ top scorer a year ago, Struthers replaced the first-round pick in the 2013 OHL Priority Selection in skating between Burghardt and Brazeau, contributing 14 goals and 13 assists for 27 points in 30 games with North Bay. The Battalion, with a won-lost-extended record of 30-28-10 for 70 points, returned to the playoffs after missing the postseason for the third time in the franchise’s first 19 seasons a year ago, finishing third in the Central Division and sixth in the Eastern Conference. Defenceman Adam Thilander scored 12 goals and added 30 assists for 42 points in 68 games to rank third in team scoring, while Brad Chenier registered 17 goals and 14 assists for 31 points in 66 games. 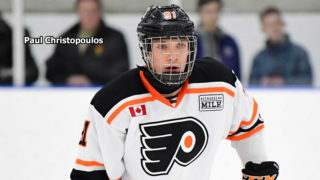 Adam McMaster scored nine goals and earned 19 assists for 28 points in 64 games, and Kyle Potts contributed nine goals and 16 assists for 25 points in 61 games. 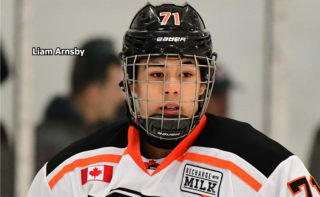 Luke Moncada, who arrived with Burghardt in a June 27 trade from the Guelph Storm, and rearguard Jesse Saban each totaled 24 points, Moncada with nine goals in 67 games and Saban with three tallies in 68 games. After failing a year ago for the first time in its history to have a player with a three-goal game, the Battalion saw Burghardt, Chenier and Brazeau accomplish the feat this season. Brazeau led the team with six game-winning goals, followed by Chenier and Jake Henderson, acquired in a Jan. 9 trade with the Kitchener Rangers, with three each. 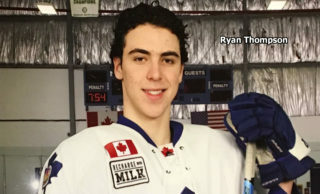 North Bay was credited with 213 goals, ranking 17th in the OHL. The Sault Ste. Marie Greyhounds produced a league-high 317. The Battalion was charged with 237 goals against, 10th-best in the league. Sault Ste. Marie again was No. 1, at 186. Brazeau led the Troops with 16 power-play goals, followed by Thilander with seven. Burghardt and Andy Baker netted five apiece. 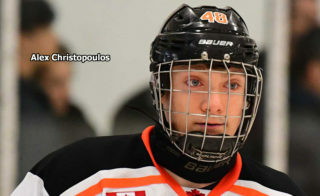 North Bay scored 52 power-play goals in 261 opportunities for an effectiveness rate of 19.9 percent, 11th in the OHL. The Kingston Frontenacs deployed the top-ranked power play at 25.7 percent. The Battalion scored six shorthanded goals, led by Brazeau with three. Patrick Brown, Burghardt and Moncada had the others. The Troops allowed 53 power-play goals in 255 times shorthanded for a kill rate of 79.2 percent, 12th in the OHL. The Sarnia Sting iced the top-rated penalty killers at 88.5 percent. Burghardt had a team-high 81 penalty minutes, while Riley Bruce was a close second with 80. Daniel Walker, Chenier and Saban each was assessed 64 minutes. North Bay was 13th in the league in penalties at 10.1 minutes per game. The Sudbury Wolves led the penalty parade at 12.9 minutes a game. In plus-minus figures among players with 34 or more games, making up at least half the season, Potts topped the Troops at plus-4. Brazeau, Burghardt, Thilander and Saban were the only players to see action in all 68 games with the Battalion, although Henderson played 68 games in total, including 28 with North Bay. In 32 appearances, goaltender Christian Propp, acquired in an Oct. 22 trade from Owen Sound, posted an 18-9-5 record with a 2.86 goals-against average, a .908 save percentage and one shutout. Julian Sime was 9-14-5 in 33 appearances with a 3.33 GAA and an .896 save percentage. Mat Woroniuk had five appearances, going 2-1-0 with a 4.22 GAA and an .843 save percentage. Christian Purboo was 1-4-0 in five appearances with a 5.06 GAA and an .841 save percentage. Propp and Sime shared one shutout. North Bay went 18-9-7 at home and 12-19-3 on the road. 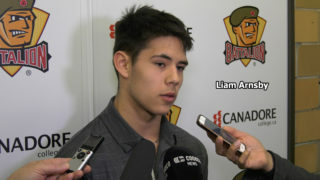 The Battalion, 22-18-6 within the conference, was 16-9-1 within the division and 6-9-5 against the East Division. In going 8-10-4 against the Western Conference, the Troops were 3-5-2 against the Midwest Division and 5-5-2 against West Division foes.